If you want to put me in a really foul mood, ask me to find something for you in a dark, overstuffed closet. Perhaps one missing boot hidden under a rubble pile of shoes & boots & brooms & tennis raquets….? The school bus is about to leave but we need that boot, quick!!! NOW. 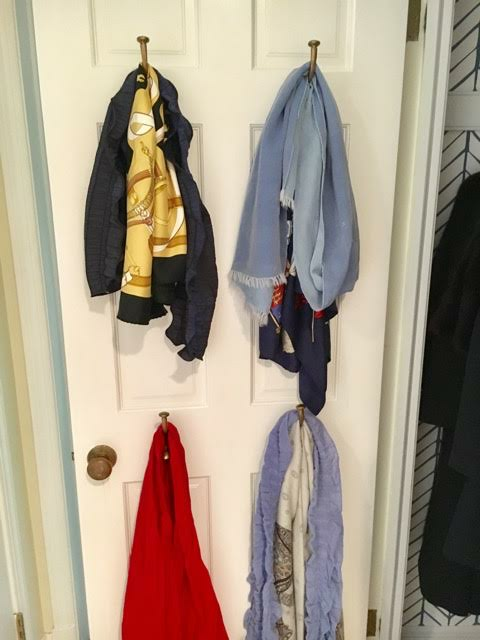 I finally decided to quit the scavenger-hunt approach & give that front hall closet some love. Two rolls of very inexpensive Serena & Lily wallpaper (only $88 each) & a little coat purging later and I now have a super cheerful closet…. My daughters havent added back their coats yet so this is not EXACTLY how it will stay, but it’s close. And it’s so much prettier that I think we’ll try to raise our game a bit (hint hint, Avery & Haley, if you are reading this!). The hooks (from Anthropologie a while back I believe) were already there but kind of overloaded. Now it’s easier to see everything & it just works. I still want to add a little sisal rug for the floor there, but hey, that can wait…main thing is it’s no longer a depressing black hole. And Mom is no longer swearing under her breath when she goes in there! Miracles can happen. Next week I’m tackling my Linen closet - stay tuned! * Note: In case you’re thinking of ordering the Serena & Lily “Feathers” wallpaper, it is much more blue & peppy in real life. Something about the lighting in my photos makes it read more gray than it actually is.